This detached holiday home with private swimming pool is located in the centre of L Escala. You approach the nicely furnished holiday home via a stairway. Located in L'Escala, Les 4 Saisons offers an outdoor pool. Accommodation will provide you with a terrace. 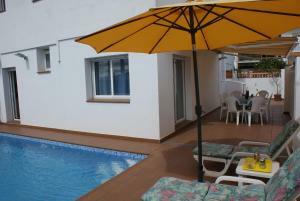 This detached holiday home with private swimming pool is located in the beach resort of L Escala. There is a bedroom in the tower. Située à 2 km du centre-ville de L'Escala, la maison de vacances La Mimosa propose une piscine extérieure, une terrasse meublée et un service de location de vélos. La plage est à 15 minutes à pied. Bénéficiant d'une piscine extérieure ouverte en saison, d'un barbecue et d'un parking gratuit, la maison de vacances Holiday Home La Marinada L Escala est située à L'Escala, à 500 mètres du centre et de la plage. Cet hébergement est doté d'une télévision, d'une cheminée et d'un lave-linge. This semi-detached holiday home with a communal swimming pool and tennis court is located near the forest in the resort of LEscala. The holiday residence is nicely furnished and the living room has an open fireplace. This is a four room house of 60 m2,1 km from the sea. There is a living/dining room with 1 sofa bed, open fireplace and satellite-TV. Holiday home Trajano 7 is situated 2 km from l'escala, outside the resort, 2 km from the centre of l'escala, in a quiet position, 800 m from the sea. This is a 4-room house on 2 levels with living/dining room with parrafin heater.